It's come to our attention that some of you would prefer a smaller sampling of what our workshops offer.... an appetizer so to speak. So, we've decided to give you a date night, a girls night, or a friend night! It's BYOB... so bring a bottle of wine or your favorite drinks, we'll provide the snacks. We will take your two photos, we will create digital negatives out of them. Then we are going to do several processes with those negatives to give you an idea of what we do in a full workshop! 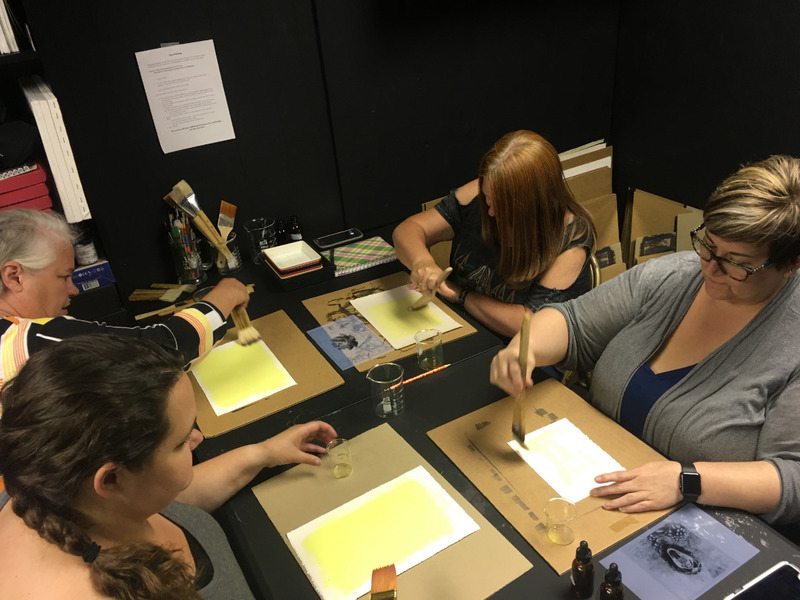 You're going to learn to coat paper, to do some alchemy with chemistry, to learn some 19th century printing processes, make your one of a kind art that you will TAKE WITH YOU.... and have an incredibly fun and artsy evening! Two photos and a bottle of wine, man....and...I made it CHEAP...how can you NOT do this? It's gonna begin at 7:00. We'll go until probably 11:00. It depends on how artsy you guys get. If you have to leave earlier, you can do it. You wanna stay and make more art? It happens at EVERY WORKSHOP...I'm cool with it. It's here at the studio in Gunter. 418 w. Main Street.